high school | Run S.M.A.R.T. One of the big reasons we started The Run SMART Project was to develop a coaching staff that could provide a unique perspective and guidance to young distance athletes. Many of our coaches are former high school standouts who went on to compete at a high level in college and then professionally. In hindsight, we can offer young athletes so much and help them get to the next level. 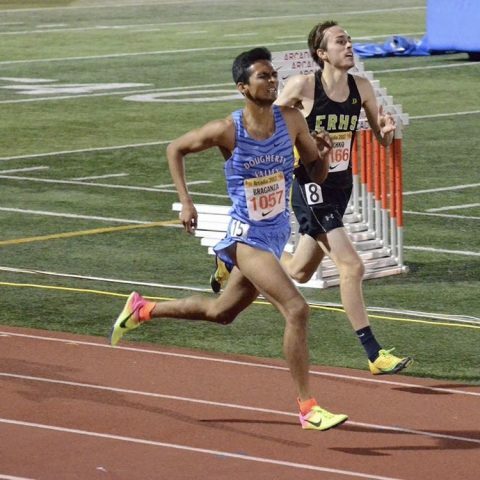 Neil Braganza of San Ramon, CA, pictured here kicking to a new 3200m PR in 9:15.72 at the Arcadia Invite, has been working with Run SMART coach Malindi Elmore since the fall of 2014. When he signed up for coaching he had run 4:22 for 1600m and 9:48 for 3200m. Since then he’s made significant progress and is now headed to Yale in the fall!